(l-r) E. Keith Colston, Celest Swann, and Louis Campbell on South Broadway in front of the Baltimore American Indian Center. Photo by Edwin Remsberg. 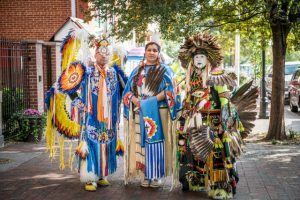 BALTIMORE, MARYLAND – In conjunction with American Indian Heritage Month, Maryland Traditions, the folklife program of the Maryland State Arts Council, is pleased to announce that the recipient of the 2017 Maryland Traditions Heritage Award in the category of “Place” will be the Baltimore American Indian Center. An awards ceremony will take place at UMBC’s Proscenium Theatre on the evening of Saturday, December 2, 2017. The public is cordially invited to attend. Free tickets can be reserved through the UMBC University Tickets website. The Baltimore American Indian Center (BAIC) has stood the test of time in Upper Fells Point. Originally founded in 1968 as the American Indian Study Center, it once primarily served as a resettlement resource for Indians who had migrated to the city seeking employment. (l-r) Louis Campbell, Celest Swann, and E. Keith Colston on S. Broadway in front of the Baltimore American Indian Center. Photo by Edwin Remsberg. Linda Cox, a daughter of one of the founders of the BAIC, says, “The Center was created to give us a place like home so we could stay connected and keep our culture alive.” Today, members of Baltimore’s American Indian community have, for the most part, relocated to areas outside of the neighborhood immediately surrounding the BAIC- a neighborhood that had at one time been popularly referred to as “the reservation.” The BAIC now functions as a cultural magnet that draws this dispersed community back in. Offering weekly culture classes, annual pow wows, a full-fledged community museum, a multipurpose meeting space and more, the BAIC continuously sustains the living cultural traditions of American Indians and Alaskan Natives of the Baltimore region. Each year, UMBC’s New Media Studios, in partnership with Maryland Traditions, produces a short documentary on the Maryland Heritage Award recipient in the category of PLACE. This year is no exception. The first public viewing of this new documentary will take place during the awards ceremony. Other 2017 Maryland Heritage recipients are: in the category of Person, documentary story quilter Joan M.E. Gaither of Anne Arundel County; and in the category of Tradition, the Deal Island Skipjack Races and Festival. The ceremony will conclude with a country blues concert by the Phil Wiggins Blues House Party. Bandleader and harmonica player Wiggins, of Montgomery County, is the recipient of a 2017 NEA National Heritage Fellowship, the nation’s highest honor in the folk and traditional arts. For more information, contact Ashley Minner at ashley.minner@gmail.com or 410-245-4303; or visit the Maryland Traditions Heritage Awards Facebook event at https://www.facebook.com/Maryland-Traditions-128048226803/.